In hitting, performers are found to adapt to the approach speed of the ball, i.e. they tend to initiate their movement at a shorter time before contact for faster approaching balls. A change in movement time is always accompanied by a change in movement velocity when the movement trajectory is kept constant. Hence, a fast-approaching ball might induce high impact velocity that is in conflict with low impact constraints, such as propelling the ball towards a near goal. In this study we investigated the capacities of participants to perform one-dimensional hitting movements in the frontal plane to balls approaching on a head-on collision course. The temporal precision (i.e. ball approach speed: 1, 1.5, and 2 m/s) and impact requirements (i.e. 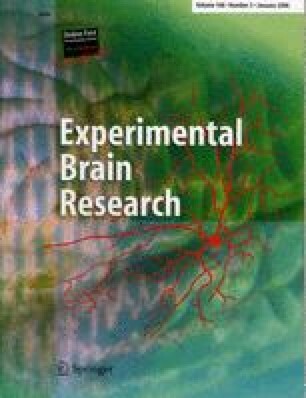 No-Goal, Near-Goal, and Far-Goal) were manipulated to examine the influence of task constraints on the temporal regulation of a stroke. The results showed that timing and speed were significantly affected by ball approach speed when the hit was not directed to a goal. In contrast, no speed-coupling and a constant time-to-impact strategy were found when impact velocity was constrained (i.e. aiming for a near goal). We were particularly interested in the nature and relation of information sources and timing patterns of movement initiation. Therefore, the relation between the time evolution of three optical sources related to the approach of the ball and the observed patterns of swing onset were evaluated quantitatively. The analyses revealed that a viable explanation for the two observed qualitatively different onset patterns of the swing is a regulation based on the absolute rate of expansion or a co-varying variable. The flexible adaptation of timing to impact constraints may be realized by an adjustment of the critical region of this optical variable. We gratefully acknowledge Claire Michaels for her insightful comments on the informational basis of the observed timing patterns in part two of this experiment. Our thanks are also due to our students Dewy van Hoogmoed, Sjoukje Hoornstra, Lotte Huizenga, and Monique Simons for their assistance in running the experiment.